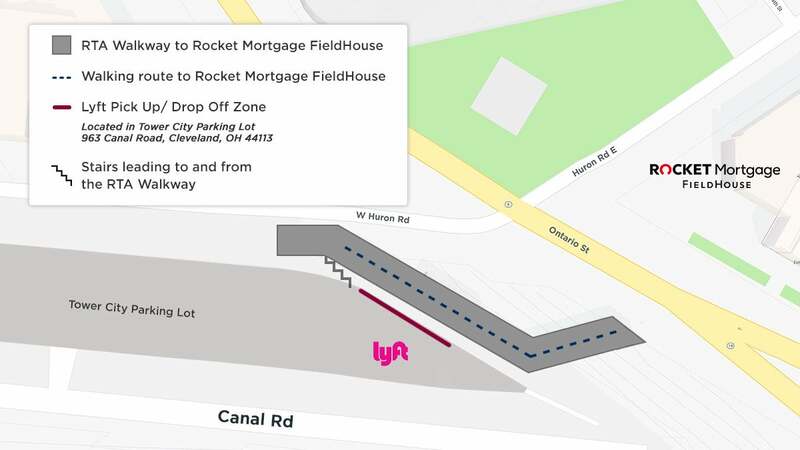 Located in the Tower City parking lot, Rocket Mortgage FieldHouse has teamed up with Lyft to provide a safe and exclusive location for Lyft drivers to pick up and drop off fans attending games or concerts coming downtown. From this location, fans will have a 1-2 minute walk in the Tower City RTA walkthrough as they enter Rocket Mortgage FieldHouse via the escalators. Steer clear of the elements outside and utilize this experience! New Lyft users can use promo code: LYFTQARENA to receive $5 OFF your first three rides. Existing Lyft users can use promo code: LIVEATTHEQ for 15% OFF two rides to and from The Q! With upfront fares in the app, you’ll always know what you’re paying before you request. No surprises or complicated math - you can decide what’s best for you and your budget. Let your friends know when to expect you at the pregame. Share route info - which includes progress toward the destination, a photo of the driver, and the vehicle color, make, model, and license plate number.